This is a guitar that feels like it has a lot of songs in it, and that’s a fine thing. Excellent 12-string for electric players. Pickup system doesn't quite capture the unplugged treble response. 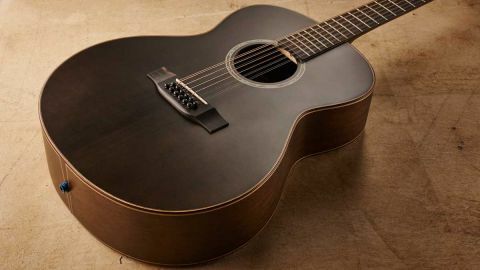 Twelve-string acoustics occupy an awkward slot in most players’ buying plans. The problem is the majority of guitarists don’t use them often enough to justify spending big bucks on a really good one, such as the benchmark Guild F-512 (with a full retail price of £3,591) or the excellent, contemporary Taylor 562CE, retailing at a wallet-winding £3,359 (although they street a lot cheaper). On the other hand, many cheap 12-strings sound ratty and are the devil to play, which is no fun. The Auden Austin, then, is a tempting proposition at just shy of £1,500. In case you’re not familiar, the Auden brand is operated by Doug Sparkes, who recently bought classic British maker Gordon Smith, before making some very canny, craftsmanlike updates to that classic lineup of electrics. Auden is his acoustic venture. The build is an interesting one. The basic shells of the guitars are hand-built in China, then shipped to the UK for a final neck-set, electronics, fretwork and finishing to be completed by a team of in-house luthiers at Auden’s workshop in Higham Ferrers. Clearly, the aim is to combine the cost- effectiveness of quality-conscious overseas construction with a touch of home-brewed finesse during the final phase of the build. So how does that pan out in reality? Our review-model Austin is a handsome instrument, with a darkly understated satin ‘Smokehouse’ finish that’s just translucent enough to reveal some of the subtly figured grain of the two-piece Sitka spruce top. The back and sides are quoted to be African mahogany, while the body’s 110mm depth feels comfortable, yet gives plenty of authority to the guitar’s bass-rich voice. One of the most striking features of the Austin is its playability - it’s the first 12-string in a while that we’ve felt just as comfortable playing fingerstyle on as we would a conventional six-string acoustic. The action, as delivered, is low and fast while a measured fingerboard width at the nut of 47.3mm feels neither cramped nor wide under the fingers. This easy-playing character is helped along by the relatively shallow-D profile and low-friction satin finish of the one-piece mahogany neck. Fingerboard, bridge and bridge pins are all made of ebony. The understated theme continues in the pretty but unshowy rosewood and maple binding. The only flash of bling is found in the tasteful abalone-and-maple soundhole ring - overall we found the vibe of restrained elegance very appealing here. Unplugged, we’re charmed by the breathy, sweet shimmer of the treble and upper mids, but it’s the definition and tightness of the bass that’s most impressive. Play fingerstyle and you get well-articulated warmth - but hit it hard with a pick and the bass tightens right up and delivers punchy volume without flub. Combined with that slippery playability, we found we were writing songs without really thinking about it, just exploring in that shimmering, Byrds-like soundworld. The onboard Schertler Lydia EQ pickup and preamp system offers basic control over volume, bass and treble with the controls discreetly tucked away inside the soundhole. Plugged into our reference AER 60 combo, the pickup system delivered a solid, natural amplified sound, which was particularly strong in reproducing that tight bass response and flattering warmth. A tad of the sparkle and nuance of the treble was lost in translation, but it’s a simple system that we’d have no hesitation in using live. At this price, it’s hard to find fault with a deftly executed 12-string that seems tailored to win converts from the electric guitar world. That playability will bring out your inner Leo Kottke in seconds - we ended up recording with it the day it arrived. This is a guitar that feels like it has a lot of songs in it, and that’s a fine thing.